What is a monster? Something that grows hair all over and howls? Could be. But the real monster is within, and when it comes out, it’s as fugly as you see it, or as it lets you see it. 5 out of 5 stars Seriously Scared the Pants off me! A group of high schoolers are headed to a survival camp over the weekend. While at the camp the teenagers learn to how to act in moments of necessary survival, and eventually they start to get a little bit better at the whole camping thing. Eventually their friendship and loyalty turns vicious. One after another the kids start to disappear from the campsite, which freaks the remaining kids out. 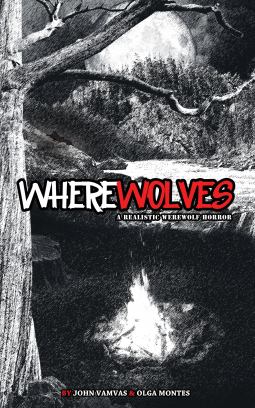 Soon they realize that they may be facing something that they didn’t think was real, but it sure does seem like there’s something more than human out in those woods, possibly werewolves. When the authors first sent me this novel, I wasn’t too excited about it. The title immediately suggests it to be a paranormal horror, and I imagined characters cowering in the dark as a fluffy thing with teeth prowled outside their walls, trying to claw its way in. 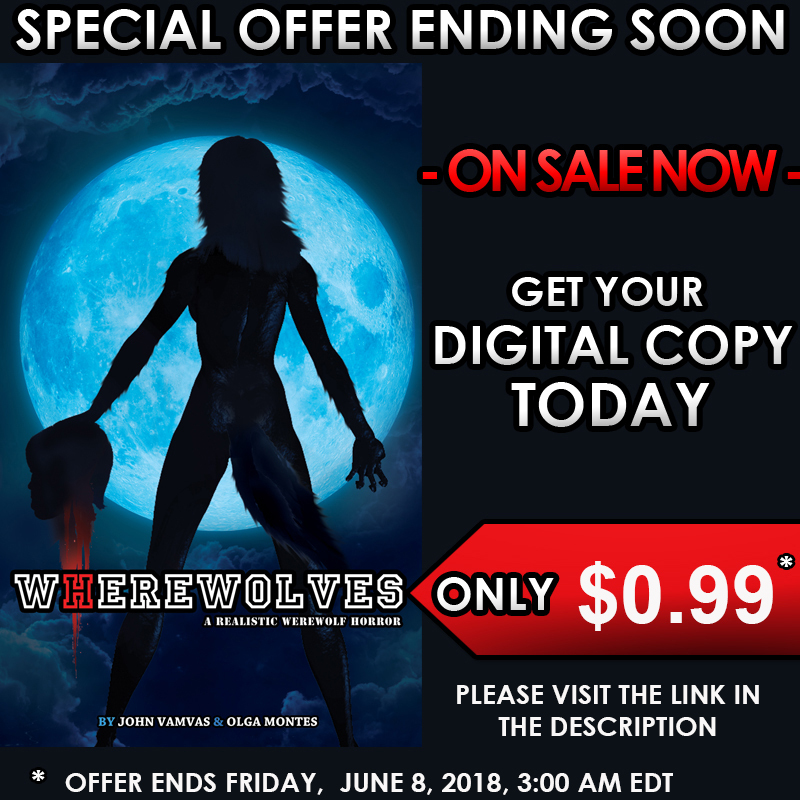 Wherewolves surprised me, as it’s so much more than that, and the fluffy thing with teeth was only a small part of the horrific jigsaw I tried desperately to piece together. The first 10% of the novel starts off as we’d expect, with a woman running for her life from (you guessed it) two fluffy things with teeth. The suspense here is unreal, and the atmosphere created is one of sheer confusion and panic. We’re thrown in at the deep end, and we think we’re on a chronological line with some idea of what we’re dealing with. We are incorrect. The narrative then abruptly removes us from the forest, and throws into more familiar, yet similarly terrifying, surroundings – a high school. It’s here we are treated to an in-depth characterisation of each of the students, and this does wonders to help us understand their fears and motivations. It’s true to life high school, with bullying, shallow relationships, and the power struggle of popularity. The knowledge we gain of the students helps make the carnage, when it comes, much more interesting as we see how humanity differs when faced with a fight or flight situation. It takes a while to get to the violence, but the build-up makes this rewarding. The students are taken on a trip to the forest as part of their soldier training. Rather than a study of supernatural monsters, it’s more of a study on the human condition, and how we treat other. The characters react to emotional abuse, each of them battling with their own inner demons carved from traumatic past experience. The suspense, gore, and violence involved is worthy of a B-movie. I particularly liked the monsters remaining ever so slightly out of sight, adding to the tension, saving us from an overdone focus, and keeping the unknown behind the veil until the last moment. There are a good few twists thrown our way which make us question everything we’ve already learned; I love being kept guessing until the last gasp and being forced to change my perception, so this was a welcome device. Seeing everything come together at the end, and basking in the horror of it all was wonderful. Vamvas and Montes had originally written this story as a screenplay, which I’m pleased to hear is currently in production. At times, it really does feel like reading a screenplay; details seem to have been added as an after thought, and dialogue takes precedence over description. This doesn’t actually impact the enjoyment of the story too heavily, instead adding to the fast paced character development, which is an important factor. I do feel some more descriptive elements could have helped the novel flow more smoothly. A true social commentary where we come to understand monsters are human, and can be made that way by other humans. An incredibly worthwhile read, which I’m glad I was asked to review – thank you. ★★★★★ It’s by far the best book I have read this year if not in the last 18 months. Twists and turns, with a very different take on a classic tale of the monster lurking inside. Looking forward to the sequel.